The pumpkin is a versatile vegetable. It is one of the oldest cultivated plants in the world, and is considered among Nature’s most perfect foods. Throughout history, parts of the pumpkin have been used for food, medicine, mats, storage containers and floatation devices. It was a documented presence at the first Thanksgiving in the American colonies, where, once opened, it was filled with cinnamon and spices and milk and buried in hot cinders until piping hot. The inside was then scooped out as a custard-like dessert, cementing its iconic status at the Thanksgiving table for generations to come. Today, its most significant impact comes from its seeds and the oil pressed from the seeds. In the US, pumpkin seeds were listed as an official medicine for parasite elimination from 1863-1936! Virgin Pumpkin Seed Oil is a rich source of nutrients that may contribute to bone and heart health. The presence of tryptophan in the seeds of the pumpkin is thought to have a calming effect. 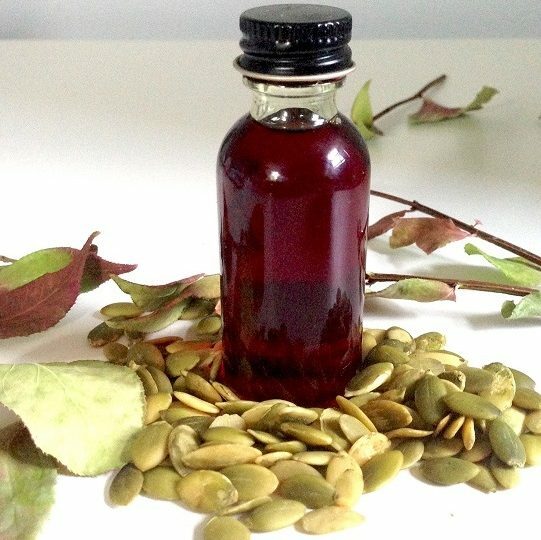 One of the biggest benefits of virgin pumpkin seed oil is its high level of natural antioxidants, particularly the gamma-tocopherol form of Vitamin E, which is a powerful skin rejuvenator. That coupled with its high level of fatty acid content could contribute to its skin moisturizing and preservation properties. Beyond anecdotal testaments to its health benefits, however, virgin pumpkin seed oil is also a culinary delicacy. As one of the most dichromatic substances in the world—it can appear dark red in concentrated volumes and a rich green in thinner quantities—it makes an unmistakable visual impact as a garnish. Its rich, roasted nutty flavor has a delectable influence dolloped on a savory soup or drizzled over ice cream or salad. Jedwards’ rich green Extra Virgin Pumpkin Seed Oil delivers an excellent nutritional and taste impact and is cold pressed and food grade. Though pumpkin seed oil is rich in polyunsaturated fatty acids, it is very sensitive to heat and loses its essential fatty acids when used as a cooking oil. Experience the many uses of our Extra Virgin Pumpkin Seed Oil and have a Happy Thanksgiving!